Q: Would gravel be best for bag fill in the lower rows to prevent wicking in a wet climate? A: This would likely be an excellent idea. 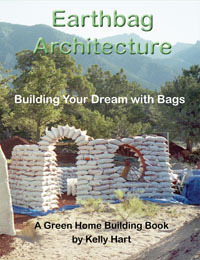 Such bags with gravel have been used successfully for foundations for strawbale building. Q: I am planning on building an earthship and am researching the possibility of building it using earthbags. I would be doing a multiple U and hut design so most of the walls would be curved for strength. The soil at the site is a heavy red clay that gets rock hard and is very rocky. Most of this area (central NC) seems to have similar soil. I would like to do a partial berm on the north side for cooling. My first question is about foundations. What kind of foundation do earthbags require? Could I place a couple of layers of tires down and use those as a foundation? A: I think your idea of building an earthship using earthbags instead of tires is an excellent one. Earthbags are much more versatile, easier to use, just as durable as tires, much less work to "pound", require much less plastering to make a smooth wall, and are less likely to off-gas over time. Earthbags themselves provide their own foundation. In fact earthbags filled with gravel are often used as a foundation for other types of construction, such as strawbale walls. Starting out with tires is unnecessary and would create much more work. Q: My question is about earthbag foundations and strawbale buildings in a seismic area. Any thoughts on this subject? The structure is going to be a small, pole built shed with a bale wrap, so the bales won't be "structural" in the sense of holding up the roof. I'm guessing that the concern in a seismic area would be the multiple forces on the foundation....up down and side to side, effectively taking the foundation apart at the seams. I really appreciate your help on this as down here in Costa Rica.....I'm kinda on my own! A: I know of several strawbale projects built upon earthbag foundations quite effectively. In Costa Rica you wouldn't have frost upheaval issues to deal with, so it should be pretty straight forward. I would suggest filling the first course or two of bags with gravel, so that water will not wick upward towards the bales. As far as seismic concerns, I think bag foundations would likely hold up way better than concrete, which has no give whatsoever. At least the bags can flex some without failure. You might be surprised how strong a bag wall is, once the two strands of barbed wire are placed between each course, the whole thing is tamped into place, and some sort of plaster is applied to the exterior to protect the bags. Seismic testing that was done at Nader Khalili's CalEarth site demonstrated considerable resistance to failure. If the bales are simply infill material in a post and beam structure, I don't see why you should be concerned, even if the walls shook a bit. You might somehow attach the barbed wire from the bags to the poles, to help tie the foundation to this rigid structure. Q: I am trying to find a formula for materials ratio in bags for an earthbag foundation for a strawbale home. Specifically what materials and what ratio. A: I recommend the use of washed 3/4 minus gravel to fill earthbags for strawbale foundations. This will keep any water from wicking upward and will provide a bit of insulation at the same time. Of course the bags need to be well protected from the sun and physical damage with a good plaster...and rather soon.